The mighty Leo has fallen. After spending the entire year so far at #1 in Supporting Actress, the pick up of I, Tonya by Neon for a 2017 awards-qualifying release shot Emmy-winner Allison Janney all the way to the top for the first time. While a handful of Gold Rush Gang members had Janney in before the announcement, some of us held off until something official came down the pike. And did it ever. Janney’s nightmare skating stage mom LaVona Golden jumps all the way from #12 (where she was heading downward) to capture gold. There’s another big mover on this month’s chart and it comes from the smallest place. 6-year old Brooklynn Prince bursts into the top 5 with The Florida Project on the heels of its release this weekend and utterly rapturous reviews for the pint-sized newcomer. She could follow in the footsteps of Best Actress nominee Quvenzhané Wallis (Beasts of the Southern Wild) and be the youngest person ever nominated in Supporting Actress. That is, unless A24 pushes her lead. But in a year where Best Actress is absolutely stacked and already seeing leads going supporting (more on that later) the safe bet for Prince is here. These two new entries in the top 5 definitely caused some reshuffling of the list but Holly Hunter (The Big Sick), Laurie Metcalf (Lady Bird) and Octavia Spencer (The Shape of Water) are still in it. Hong Chau (Downsizing) enjoyed a single month in the top five but drops hard to #10 this month. The big shocker though is former #1 Melissa Leo (Novitiate). After the dust settled she lands at #6 but still with an evil eye to that top 5. I think she will find her way back as some of the ladies on the list could be vulnerable to Leo’s mother superior and Sony Classics’ best chance at a female performance nomination. Emmy-winner Tatiana Maslany (Stronger) hits in a big way this month, arriving from the Other Contenders list to #7 this month on the strength of very good reviews for her film and performance and co-star Jake Gyllenhaal’s top 5 status in Best Actor. 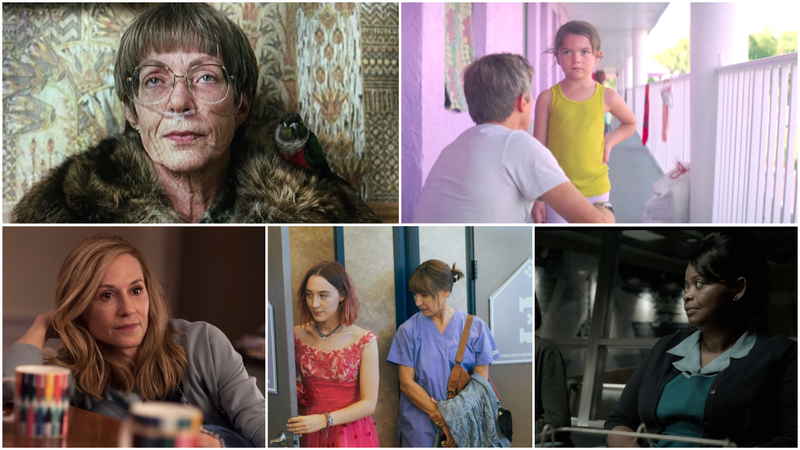 Two actresses find themselves at a crossroads this month in terms of category placement. For Claire Foy (Breathe) she has been in lead all season until last week when Bleecker Street announced she would be run in supporting. The dutiful wife to a Best Actor contender has traditionally been frauded here and sometimes even wins (Jennifer Connelly in A Beautiful Mind, Viola Davis in Fences just this year) but other times a successful lead campaign can be fought and earned (like Felicity Jones in The Theory of Everything). Phantom Thread‘s Vickey Krieps is someone whose votes are split between lead and supporting but without a guideline or confirmation for either category. Struggling but still holding on are Kristin Scott Thomas (Darkest Hour), Mary J. Blige (Mudbound) and Juno Temple (Wonder Wheel). Temple could see a rebound soon with the trailer released today and the film closing the New York Film Festival next week. Falling off the chart this month are former top 5 Michelle Pfeiffer (mother!) as well as Carmen Ejogo (Roman J. Israel, Esq. ), Rosamund Pike (Hostiles), Catherine Keener (Get Out) and Andrea Riseborough (Battle of the Sexes). Here are the 2018 Oscar predictions for Best Supporting Actress for October from the Gold Rush Gang. Keep an eye on all of the Gold Rush Gang’s 2018 Oscar predictions updated LIVE throughout the month. Carmen Ejogo – Roman J. Israel, Esq.